Jacqueline Sheehan - Come to Prague with Jacqueline and Julie Maloney! Come to Prague with Jacqueline and Julie Maloney! JACQUELINE SHEEHAN, NYTimes bestselling author, and JULIE MALONEY, director of WOMEN READING ALOUD, will lead the writing workshops. Open to writers in all genres, workshops follow the Amherst Writers and Artists Method, emphasizing the exploration of the authentic "voice." Julie hails from NJ and Jacqueline lives in MA. They have worked together for over ten years at the Writer's Weekend Retreat in Sea Girt, New Jersey. TIGER IN THE HOUSE is available! Tiger in the House is a Finalist for a Star Award! As she seeks to discover where Hayley belongs, Delia must decide how deep to venture into the unknown, whether in shaping the destiny of the child who has no one else to turn to—or in exploring the fierce dark corners of her own soul. In my new book, THE TIGER IN THE HOUSE, I had to research the heroin epidemic and here's what I found out. Read the first chapter of THE TIGER IN THE HOUSE! Love independent bookstores? Order TIGER IN THE HOUSE through IndieBound! Jacqueline is on New England Public Radio and WAMC Albany, NY! Soccer before the Women's World Cup. Listen to Jacqueline's essay on WAMC! Listen to Jacqueline's lastest radio commentary on New England Public Radio. Watch an interview with Jacqueline and Cooper, played by Captain the dog. 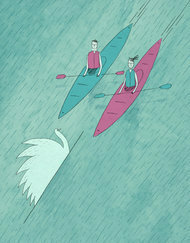 Jacqueline's New York Times article about love, divorce and swans. How do you keep a secret so huge that it could devastate everyone you care about? For Kate Malloy, the answer is simple: one lie at a time. Come back to Peaks Island, Maine with Jacqueline Sheehan's new book, Picture This. "A well-researched, enjoyable read, with a poignantly engaging young hero." Order Picture This from an independent bookstore on Indie Bound! Order Picture This at Barnes&Noble.com in paperback, for Kindle or for the Nook!